- Antique print, titled: 'Le comte de Zeelande. - Nova Zeelandiae Comitatus .' - (The Duchy of Zeeland.) 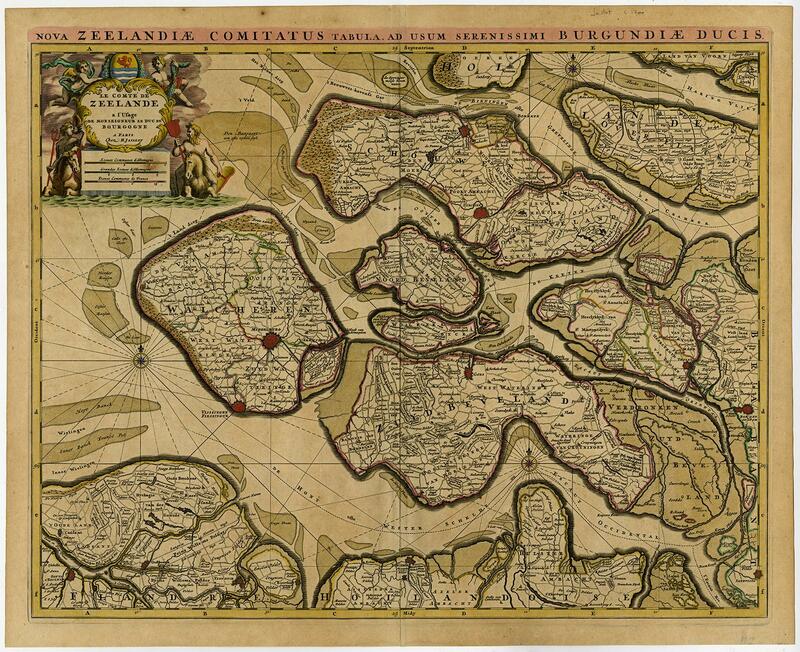 This map shows the province of Zeeland in the Netherlands. Original handcoloured engraving on hand-laid paper. Description: This plan originates from: 'Atlas Nouveau . ', published by H. Jaillot, 1674 and later. Exct ed. of this map unknown, but a well inked earlier ed.Artists and Engravers: Anonymous. Condition: Excellent, given age. Original middle fold, as issued. Some paper separation in the lower middle fold, reinforced using contemporary paper backed with acid free archival tape. A rust hole in the cartouche top left, reinforced using contemporary paper backed with acid free archival tape. General age-related toning and/or occasional minor defects from handling. Please study scan carefully. Storage location: TPC-Expo-P11-02 The overall size is ca. 25.2 x 20.5 inch. The image size is ca. 23.7 x 19.2 inch. The overall size is ca. 63.9 x 52 cm. The image size is ca. 60.2 x 48.7 cm.